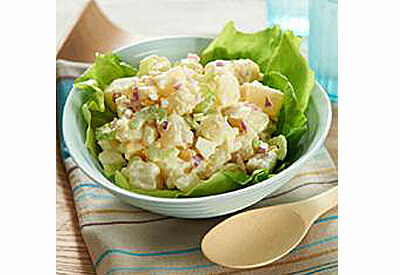 The Original Hellmann's Potato Salad Recipe! Cover potatoes with water in 4- quart pot; bring to a boil over medium high heat. Reduce heat to low and simmer until potatoes are tender, about 10 minutes. Drain and cool slightly. Combine mayonanaise, vinegar, salt, sugar and pepper in large bowl. Add potatoes, celery, onion and eggs and toss gently. Serve at room temperature or cover and refrigerate for at least 4 hours. If desired sprinkle with paprika.